Keurig is popular amongst coffee lovers for being one of the very first names that offer single cup brewing and serving as well as many other distinct features. There are many products to choose from with varying prices. However, all the products appear to be remarkably similar. This is why coffee lovers generally look for information online before purchasing the best coffee maker. All Keurig coffee makers can be taken from one place to the other without any trouble since all the models are lightweight. 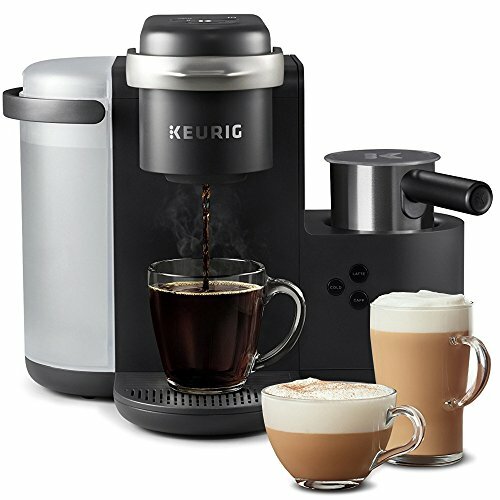 Here are 10 of the best Keurig Coffee Makers that you can choose from to make your life easier and more enjoyable. We will help you to make the best choice! Affordable, reliable, durable and good-looking. Makes great coffee, lattes & cappuccinos. Cheap, great coffee, excellent style, easy to use. Looks really nice in the kitchen – awesome design. A bit slow brewing time. Takes up more counter space. Nothing important to be mentioned. A long time to warm up for the first cup. Keurig was founded in 1992 and immediately got an overwhelming response from the public. The reason for this is obvious: Coffee is an important part of every individual’s morning routine. Since then, the customer base for Keurig has been constantly increasing. The idea behind coming up with a coffee maker such as that of Keurig was to transform the brewing process. The invention came into being due to the efforts of two college mates John Sylvan and Peter Dragone. The name of the brand came straight from a Dutch dictionary which means excellence. This was the perfect name for their venture as they intended to make it possible for the public to enjoy a superior and excellent cup of coffee every morning. However, the process of creating the final product was not as easy as Sylvan landed in the emergency room due to caffeine poisoning. This happened because of the excessive consumption of the beverage while attempting to come up with the perfect coffee maker. While still in the beginning phases of the invention, a company called Green Mountain Coffee realized its potential. This transformed everything for Keurig and slowly the passionate inventor Sylvan had to step down and give total control to Green Mountain Coffee. It was later in 2006 that the entire ownership was transferred to Green Mountain Coffee. The company prospered significantly since the non-reusability of the K-cups caused a drastic increase in their sales. Moreover, the coffee makers were initially thought to be perfect for office use only. They were considered to be restricted to such use, but this trend changed rapidly. Today, Keurig coffee makers are a part of numerous homes and are even placed in the rooms of different hotels. The size and weight of the different Keurig makers are what sets them apart. All the models can be conveniently used in any space without any hassle. 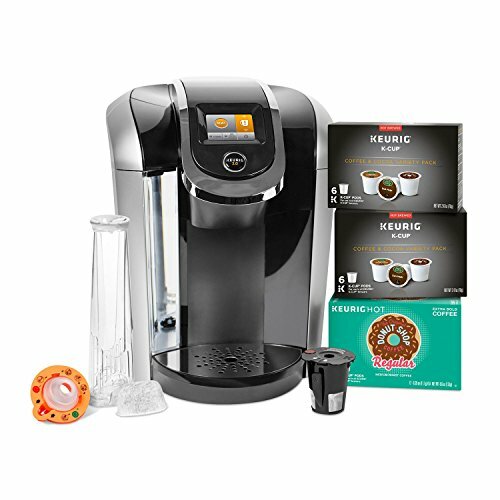 If you are still wondering about the reason for the popularity of Keurig, you can look at the variety of beverages offered. K-Cups were designed to make single-cup brewing possible. Today, more than 75 brands offer K-cups that can be used to enjoy not only coffee but also tea, cider, and hot chocolate. With such an all-in-one machine, that can whip up whatever your heart’s desire, is what makes people fall in love with Keurig. One of the classic models offered by Keurig is the K575 which is compact and can be placed on any countertop without any hassle. 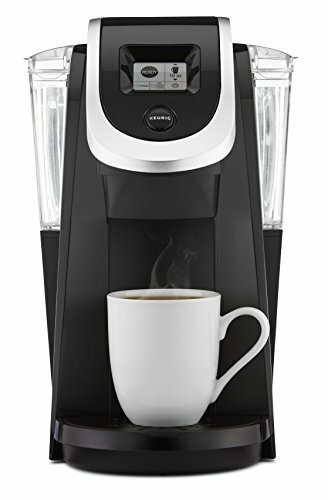 The Keurig K-Carafe is not included in the model and can be easily bought separately from the same manufacturer. The classic version of this model can brew a single cup whereas the plus model has variations in the capacity. 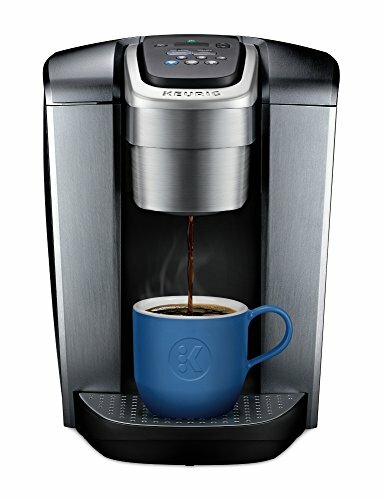 The model does not only brew coffee in a cup (K-Cup) but instead has a capacity of brewing a single travel mug (K-Mug) as well as a carafe. You can also buy a reusable filter that can be used in case you wish to brew ground coffee of your own choice. There is an 80-ounce reservoir for water that can be easily removed along with a touch-screen display. The display of the K575 model is considered to be larger than usual and therefore makes the coffee maker convenient to use. The reservoir for water has plenty of storage capacity which makes it possible for coffee lovers to enjoy 10 cups of coffee without having to refill. The removable feature of the reservoir is found to be remarkably convenient for regular coffee drinkers as it does not require them to transport the whole machine when filling the tank. You can control the temperature (5 settings available) of your coffee and monitor the timing of the whole process by looking at the digital programmable clock. There is an auto brew option which can be used to pour yourself a cup of coffee on time every day. 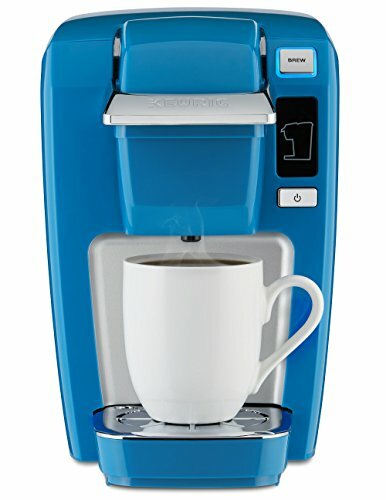 The pods can be used to enjoy coffee from a long list of famous American coffee brands including Maxwell House, Peet’s Coffee, and Starbucks. The dimensions of the coffee maker are 13.2” x 10.5” x 13.3”. Other than all these features, there is also a night light option within the coffee maker that is specially incorporated for individuals that like to enjoy a cup of coffee late at night. The energy saver option lets you consume a minimum amount of electricity while you use a sophisticated coffee maker. There is also a strength control option with which you can use to decide how you like your coffee. To eliminate the need for managing the settings every time, you can choose a particular one as your favorite. The lid on top is convenient and can be used to determine when the coffee maker needs a refill. There are also other customizable options such as different wallpapers to choose from. The K575, therefore, delivers a unique experience. 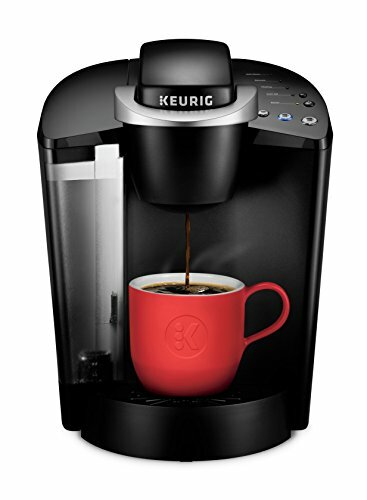 Keurig’s K-café Single Serve K-Cup Coffee Maker is all that any coffee lover around the world could wish for. This is the product is not merely for brewing coffee but has the ability to do a lot more than that. Other than being a coffee maker, this product is also known as the Latte and Cappuccino Maker. Like all other coffee brewers by Keurig, this one also offers strength options for you to choose from. So, you can easily choose how strong you would like your coffee to be. By removing the tray underneath, you can also fit a travel mug to enjoy freshly brewed coffee on your way to work. There are a total of 4 cup sizes that you can get out of this product (6, 8, 10, 12 oz.). The water reservoir is removable along with a handle which makes the refilling process a relief. The size of the water reservoir is another attraction of the product. The 60 oz reservoir can hold 6 cups of coffee for brewing which eliminates the need for you to refill now and then. There is an ‘add water’ light that blinks to alert the user whenever the reservoir needs to be filled which means you will not have to check the water level frequently. 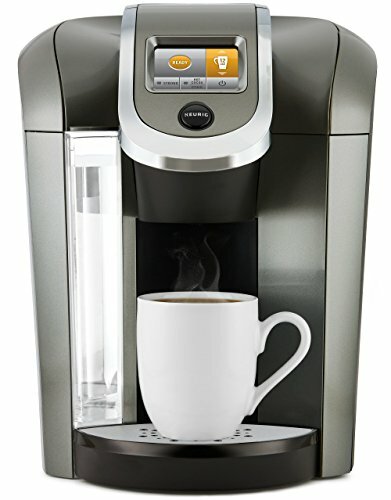 Like all the other models by Keurig, this one is also lightweight (10.0 lbs.) and thus can be taken from one place to the other easily. The dimensions of the product are 12.5” (H), 15.3” (W), and 11.7” in depth. You can use any K-Cup® Pod in order to get the beverage of your choice. You can also choose your own ground coffee since the reusable filter is compatible with the product. The auto-off option when selected causes the product to turn off after 2 hours. If you wish to have the machine on at all times, you can turn it off. The option can be changed by holding the strong and 10-ounce button for 3 seconds on the machine. The fact that this product is also a latte and cappuccino maker creates the need for more features and options. The product comes with a frother that can be washed in the dishwasher and hence requires little maintenance. You can use skim, soy, almond, or fresh milk according to your choice. There is also a cold option for froth milk which makes it possible for the user to enjoy iced latte and cappuccino. There is a line inside the frother than reflects how much milk is needed to make a latte or a cappuccino. To get a strong shot for lattes and cappuccinos, you have the ‘shot’ button on the top panel of the machine. You can put the pot in the holder and press the latte and cappuccino button. Within the 30-45 seconds, you get a cup of your favorite beverage. After this, all you need to do is froth the milk and get a delicious beverage. Enjoy 8 cups of freshly brewed coffee without worrying about refilling the reservoir. Not only that, the reservoir can be easily removed which makes refilling a convenient process. With a 75 oz. water reservoir and a brewing duration of under a minute, this coffee maker is simply exquisite. The capacity of brewing ranges from 4 oz. to 12 oz. and you can even choose the strength of your beverage according to how you like it at any temperature you want. The water reservoir can hold 70 oz. which makes refilling an infrequent activity. You can enjoy 7 cups of freshly brewed coffee without having to worry. 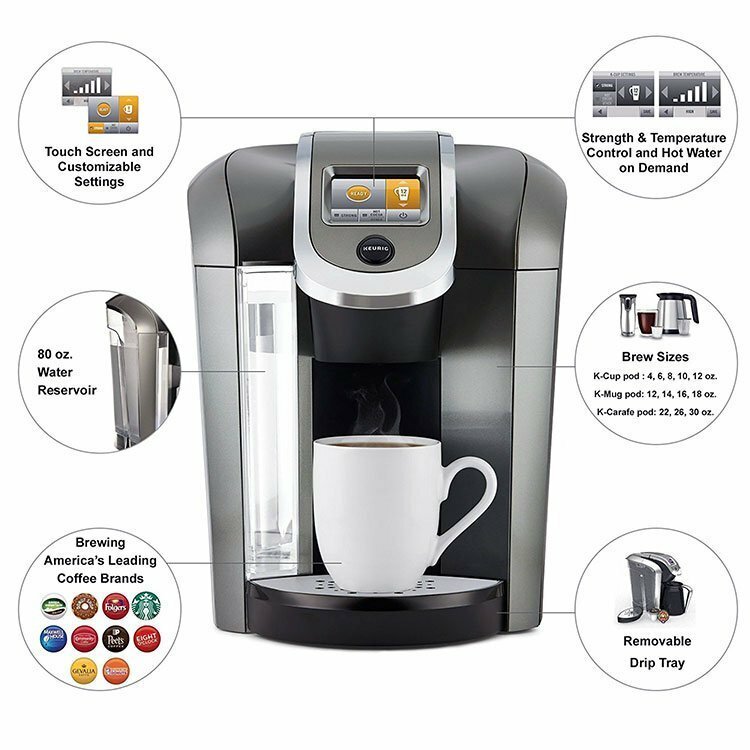 The machine also incorporates some of the most advanced features such as strength control which lets you choose how you want your beverage to be. There are 5 settings for the temperature that allows you to enjoy an ideal beverage fit for your unique needs. The energy saver mode helps you conserve energy without you having to do anything. It automatically shuts off after identifying inactivity. Other than that, the tray can be removed easily to make up more space. That’s not all. You can also select a favorite setting that eliminates the need for you to choose the right options every single time. The visual appeal of this machine is also what makes it popular. Apart from the functionality, there is also a language setting that makes the experience of making coffee even more interesting. The coffee maker weighs 10.0 lbs which means moving it around is not going to be a problem at all. The next coffee maker on the list is K-Classic which is considered to be an excellent companion for everyday use. The product is excellent for brewing coffee within less than a minute and can accommodate for 3 different sizes of cups (6 oz., 8oz., and 10 oz.). This particular coffee maker is considered to be a classic since it has a few useful features and can provide you with a delicious cup of coffee within minutes. Individuals that only expect a richly flavored cup of coffee can choose this product. The design and structure of the coffee maker are incredibly simple and can be placed anywhere in the kitchen. The product comes with a 48 oz. water reservoir that can be easily removed to be refilled. This particular feature is highly appreciated by people that frequently drink coffee as it holds more than 6 cups at one time. This means that you no longer need to refill the reservoir again and again. The descaling option on the coffee maker helps you clean your product thoroughly. This process includes getting rid of the calcium deposits that sit in with time. Other than that, people that are conscious about their energy conservation habits can choose the auto off option which is programmable. You can use any brand of pods and enjoy a delicious cup of coffee of your own choice with this coffee maker. The product is compatible with some of the most popular names amongst the coffee lovers. The dimensions of the coffee maker are 13.3” (H) x 10.1 (W) x 13.2” (D) and the product weighs 10.6 lbs. This coffee maker is probably one of the most visually appealing machines out there. With numerous color options (11 to be exact) you can choose one that goes in accordance with your kitchen’s theme. The coffee maker can accommodate for a cup, travel mug, as well as a carafe. All of this is possible by removing the lid and making more space to enjoy a delicious beverage of your choice. You can select the strength of your beverage according to your own taste. There is a 40 oz. water reservoir and a 2” touch display all available in an incredibly compact model. The brewing capacity ranges from 4 oz. to 30 oz., making it perfect for any kind of use. It can also be used to enjoy hot cocoa and is compatible with some of the most popular names in the world of coffee. The simplicity of the product coupled with its visual appeal is what makes this one an absolute favorite. If you are looking for a coffee maker that is sleek and incredibly functional, this particular model would be your best option. Whether you wish to brew coffee for your cup, travel mug, or carafe, this product won’t let you down. With enhanced capacity, this coffee maker can give you your favorite beverage in no time. The product can also be used to brew your ground coffee by using the reusable filter. Like all the other models, this one also has an extremely simple design making it easy to move around. The product is also lightweight (8.8lbs) only to make the users experience better and smoother. The water reservoir for this model is also removable making refilling process a breeze. The reservoir can carry 40 oz. and the brew sizes vary from 10 oz. for a cup, 16 oz. for a travel mug, and 30 oz. for a carafe. You can also select the strength of your beverage according to your liking. All these options are easily chosen from the black and white display on top of the coffee maker. If you are willing to experiment with colors, there are many different bright colors available in this product. To further customize the product for your use, you can also choose a language setting of your choice. 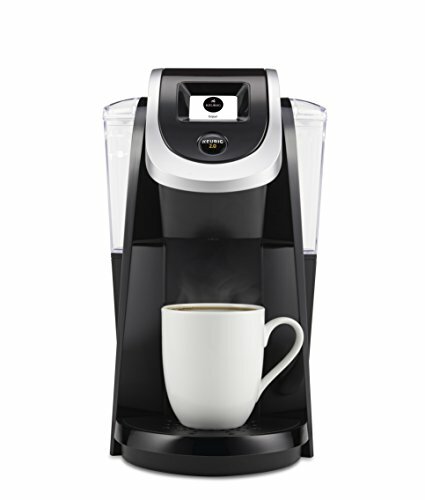 The coffee maker can brew your favorite coffee in less than a minute and also comes with a specialty beverage setting. There are 2 water filter cartridges that come along with the product as well as a descaling solution that you can use to thoroughly clean your coffee maker. This particular product is everything that individuals working in an office could ask for. With plenty of options to choose from, this product gives every individual a taste of their favorite beverage. It’s not only confined to brewing coffee but can be used to enjoy a cup of tea, certain speciality beverages, as well as iced drinks. The tray is removable which makes it able to accommodate for travel mugs as well. There is an impressive, brightly colored, LCD Display which makes it extremely convenient to use. You can adjust the temperature easily according to your needs and enjoy 18 cups before the need to refill the reservoir. The 90 oz. the water reservoir can be removed easily, making the refilling process extremely convenient. The brew sizes are four in total (4 oz., 6 oz., 8 oz., and 10 oz.). Keurig understands that with so many working in an office, energy efficiency can become a problem. This is why the product comes with an automatic on/off options that can be programmed easily. The product is compatible with more than 75 popular brands and can whip up 500+ types of beverages for the users. The drainage system eases storage as well as transportation of the product. If you believe in minimalism and simplicity, this compact coffee maker is right for you. K-15, after looking at all the coffee makers available from Keurig seems to be extremely limited. However, there is absolutely no doubt that this product can give you the most delicious beverage you are waiting to sip to start your day. The brewing capacity of this product ranges from 6 oz. to 10 oz. and the entire process of brewing takes less than 2 minutes. There are button controls on the machine and lights that will guide you throughout the brewing process. The portable design of this coffee maker makes it easy to transport it wherever you wish. If you do not have enough space in the kitchen, this coffee maker is going to meet all your coffee needs without requiring too much space. There is an auto-off the option that helps you save energy by automatically turning off the machine after 90 seconds of the last brew. The tray can be easily removed and can accommodate travel mugs as well so that you can enjoy freshly brewed coffee wherever you go. You can also enjoy hot cocoa, tea, and other speciality beverages using this simple product. All great features packed into a compact machine make K-15 stand out for customers. There are many colors available in this coffee maker which makes it a perfect item for any kitchen. This powerful coffee maker has numerous features that make it an absolute must for any coffee lover. This product is sure to be on the wish list of many since it offers only the best and most advanced features in the world of coffee makers. You can choose from a variety of options that are as exact as the strength of your beverage and the temperature. There are many brewing size options to choose from that extend to 30 oz. There is an 80 oz. the reservoir that can be easily re-filled owing to the structure of the coffee maker. There are 5 temperature options to choose from making this coffee maker the right tool to make your favorite cup of beverage. The machine is not only limited to coffee making but can also be used to enjoy a hot cup of cocoa or tea. There are also other specialty beverages that you can make using this state-of-the-art machine. You can use the product to brew for a cup, mug, or even a carafe due to its high capacity. To save electricity consumption, you can use the auto on/off the option that lets you use the product while conserving energy. The nightlight on this machine helps people enjoy a sip of their favorite beverage even when it is dark. The digital clock and the colorful display make the coffee maker all the more attractive and convenient for users. If you find yourself craving for your favorite beverage and want it to be ready within minutes, this product is for you. The machine is not only suitable for brewing coffee but can also be used to enjoy other drinks such as hot cocoa and tea, as well as iced drinks. The brew sizes are numerous ranging from 4 oz. to 30 oz. 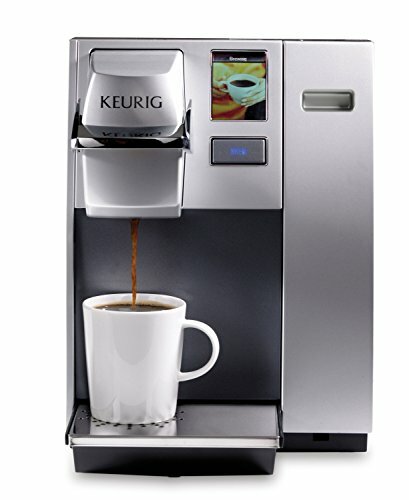 The K425 plus series can accommodate not just a cup, but also a travel mug as well as a carafe. So, now you can enjoy multiple servings of your favorite beverage whenever you wish. While brewing one cup of coffee at a time seemed like an amazing idea at first, now people are not too sure. The lack of reusability factor of the K-cups has sparked a lot of debate amongst coffee lovers about the impact on the environment. Firstly, the fact that K-cups are made of plastic does not help. Even though it is not impossible to recycle K-cups, the process takes immense sorting techniques. The public has started viewing this as a potential problem and believe that their use of Keurig can result in damaging the environment. There have been many campaigns popular on different social media platforms to support this sentiment. As a result of all this, Keurig, in 2006, introduced the recyclable K-cups that would address the issue on hand. However, even the recyclable K-cups require the user to spend an extra few minutes to properly dispose-off the pods. The campaign #KilltheKCup has forced the makers to vow to the public that a completely recyclable version of the cups is ready to launch by 2020. However, one of the founders of Keurig, Sylvan believes coming up with a totally recyclable model will be extremely difficult since the plastic used to protect the ingredients needs extensive sorting for being recycled. However, on the other end of the spectrum, the team at Keurig believes that there are many positive aspects. There is no doubt that energy is conserved since the coffee maker can be used to enjoy a single cup of beverage too. Also, because of the same feature, less water and coffee is wasted. These are some of the ways in which Keurig can save the resources and have a positive effect on the environment. Nevertheless, piling up the landfills with plastic K-cups is not something that will quickly be forgotten by coffee lovers that have green habits. 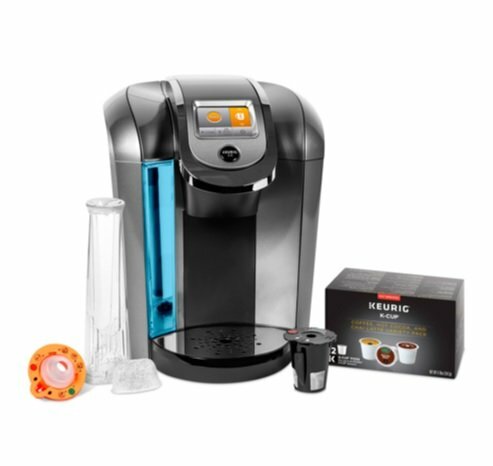 With numerous products to offer, Keurig has made a name for itself amongst coffee lovers. 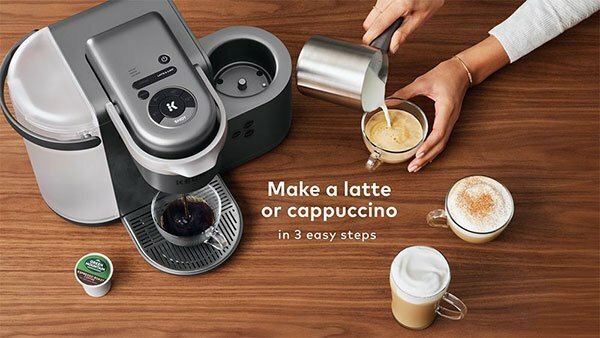 Whether you want a coffee maker suitable for everyday use or wish to have one to enjoy coffee on the go, Keurig has a solution for every type of use. The incorporation of some of the most advanced features, Keurig coffee makers are undoubtedly one of the best in the world. Choose one of the coffee makers mentioned in the list given above and witness the ease of making your favorite beverage every day with the help of Keurig.